The global economy has been hit hard by the financial crisis 2007-2008, or the subprime crisis (floating interest rate mortgages). Indeed, the 2008 financial crisis often revolves around the fall of Lehman Brothers Holdings, Inc. Famously, it was too big to fail. The closure of this bank, a great rival of Goldman Sachs Group Inc (NYSE:GS), has nevertheless been very real and created chaos in the American and European financial industry. To better understand the 2008 financial crisis causes, it is important to know what generated the U.S. housing bubble before it burst. It was a full-on case of the adage “When the United States sneezes, the rest of the world catches a cold.” Whenever the U.S. financial markets start showing signs of instability, all market economies feel the effects. Just as in 1929, the world faced a crisis that was born basically in the U.S., similar to what happened when Wall Street collapsed in 1929. But, in 2008, the crisis affected more countries than in 1929. In 1929, the Soviet Union remained outside the market system, thus it was generally immune. In 2008, Russia and all the former Soviet republics were fully integrated into the global market system, as was China. Thus, the effects of the 2008 crisis were truly global. Just as in 1929 and the Great Depression that followed, the 2008 financial crisis effects were structural. That is, it resulted from a sudden failure—a trigger event—that signaled a lack of liquidity. A three-word answer that explains why the financial crisis of 2008 happened might be: too much debt. 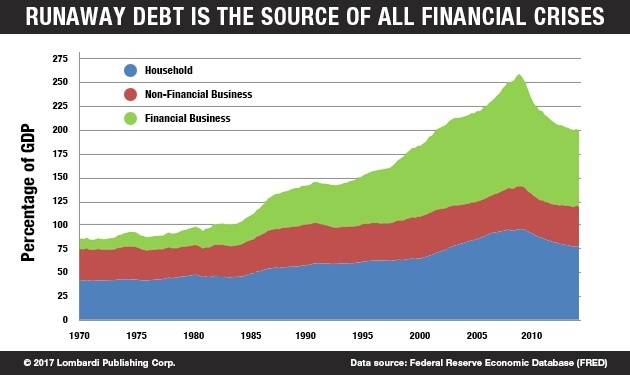 Too much debt happens when credit increases abnormally. Indeed, almost all financial crises are caused by an abnormal credit expansion. The crisis itself became international because the U.S. market was generating excess liquidity that it extended to other financially evolved markets—particularly the United Kingdom. The excess liquidity came to the United States from Asia. In the late 1990s, despite a crisis in 1997-98, rapid growth continued. In an unusual trend reversal, capital from Asian emerging economies was flowing to the United States rather than the opposite. Meanwhile, oil prices rose tremendously from 2000-2008. That contributed to the trend, as oil producers in the Middle East and parts of Asia and South America were also looking for places to park their earnings. That excess liquidity found an ally that favored speculation. When the tech bubble burst in 1999, bringing the bullish stock market cycle of the 1990s to a close, Fed Chair Alan Greenspan tried to prime the market’s pump again after the September 11, 2001 attacks. He lowered the nominal rate from seven percent in 2000-2001 to about one percent in the 2001-2004 period. Rates did not rise again, effectively, until 2005. For almost three years, short-term interest rates were negative: in other words, the cost of money for banks was zero. That liquidity and a prevailing sentiment of economic optimism encouraged American households to borrow and American banks to lend. The result was runaway debt. Suddenly, in the 2001-2004 period, many felt able to fulfill the dream of owning their own property. Banks were offering mortgages to anyone. It didn’t matter if the borrowers offered few assurances of being able to repay the loan. They were called sub-prime loans. They were granted to individuals who had low or even negligible income, having no other wealth assets. There was one catch. The banks hoped to cash in on the high interest rates that the subprime mortgage loans would eventually generate. The banks, after all, were all too aware that the subprime borrowers would be unable to pay back the loans. They were banking on the high likelihood of subprime home buyers defaulting, so they could then re-possess the properties and resell them at a profit in the booming real estate market. Thus, the sequence of events that led to the 2008 financial crisis, the timeline of the crash, starts with subprime mortgage lending. In sum, this was a form of lending in the United States made possible by a surge of liquidity, which made more credit available. It was then magnified by greed as the lenders thought they could make money on high interest. Or, they could take over homes in a booming real estate market at bargain prices, as the borrowers would default. But, the second element in the timeline, or the sequence is “financial innovation.” Derivatives and options, so-called financial products developed in the 1980s and 1990s, made it possible to securitize mortgages into financial securities. In short, groups of sub-prime mortgages were transformed into options or even bonds through a securitization process. In so doing, the lenders unloaded their risk—of which they were fully aware—into high-yield investment instruments. These banks had the gall to sell such products on the markets, generating millions. The names read like airport codes: ABS, CDS, and CDO. The most notorious and key to understanding the 2008 financial crisis are the CDOs or Collateralized Debt Obligations. They were the most popular “instruments.” They transferred the lending banks’ credit risk associated with the subprime mortgage from the borrower to the market. In practice, CDOs were sold in unregulated markets. The higher the risk of default, the higher the premium for those who wanted to hedge against the risk. The actual financial crisis began in the summer of 2007 with the subprime implosion. The full effects were not seen until September of 2008. In 2007, the subprime CDOs and other related and toxic products triggered the first series of bankruptcies. One of the first major victims was Bear Stearns Companies, Inc. It went bust, but JPMorgan Chase & Co. (NYSE:JPM) bought it at the last moment on March 16, 2008. Like other investment banks, Bear Stearns became embroiled in the subprime mess. Its distinction was having become one of the most prolific buyers of subprime CDOs. Bear Stearns, like its rivals, launched its own investment funds, legal entities separate from the bank and drawing on external investors. To increase its returns, it also raised debt from external banks. In 2003, Bear Stearns launched a real estate fund, the High-Grade Structured Credit Strategies Fund. It was an investment fund with a leverage of 35—that is, for every $35.00 of debt, there was $1.00 of capital. Its goal was to invest in the CDOs. In retrospect, it seems like madness, maybe even criminal madness. But, to understand Bear Stearns—not to justify it—it’s necessary to consider context of the real estate rapture of that period. In a euphoric U.S. real estate market, the first victim was common sense. Lending criteria slackened. The CDOs were backed by toxic real estate loans—the infamous subprime mortgages. Thus, in mid-2006, when the U.S. real estate market slowed and defaults on the underlying loans began to multiply, the Bear Stearns fund recorded its first losses. To deal with the fallout, the funds increased their leverage. From 35 to 100! That kind of irresponsibility was what caused the 2008 financial crisis. The situation worsened very rapidly at the beginning of September 2008. The Federal National Mortgage Association (Fannie Mae) and the Federal Home Loan Mortgage Corporation (Freddie Mac), two partial State agencies responsible for refinancing home loans to households, faced major difficulties. Then, came the Lehman Brothers collapse. That was the trigger event that prompted the domino effect. Stock markets collapsed from New York to Frankfurt, Paris, Milan, London, and Tokyo. Now, there’s the impression that another bubble is rising. The next financial crisis is imminent, perhaps even in 2017. All it will take is for Congress to reject President Donald Trump’s tax cuts and for people to realize that the U.S. economy is not growing as fast as the current hubris suggests. The 2007-2008 crisis was not just financial. It started with political decisions. 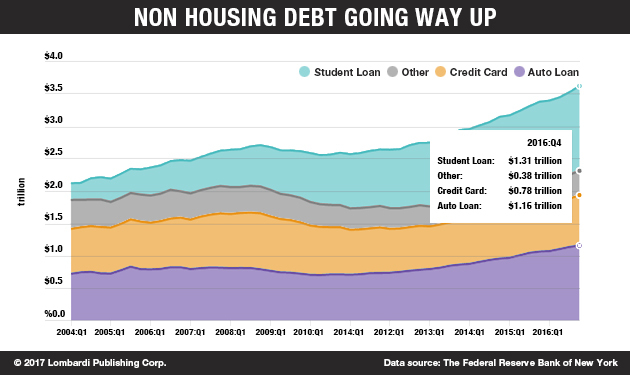 Add to that the problem of non-housing rising household debt. While the crisis was financial, there was a political component. During his second mandate (1997-2001), President Bill Clinton laid the foundations for the most ambitious banking deregulation since the pre-1929 crisis days. The deregulation scrapped restrictions on the integration of the banking, insurance, and trade sectors imposed by the Glass-Steagall Act of 1933, one of the foundations of President Franklin Delano Roosevelt’s New Deal. Glass-Steagall was intended to discourage speculation. It was also intended to protect ordinary people’s savings, preventing commercial banks from engaging in the speculative activities of investment banks. The deregulation was passed in Congress as part of the Financial Modernization Act. The “modernization” had its first effects in the form of the mega-banks. For example, Citibank absorbed a number of smaller banks to become Citigroup Inc (NYSE:C), the largest financial institution in the world. But, there was more. During the last years of the Clinton mandate, there was further deregulation. The deregulation of derivatives came along with the Commodity Futures Modernization Act of 2000 (CFMA). This made derivatives available to the general public. It’s what eventually made the packaging of toxic mortgage debt into financial instruments to be sold for investment purposes possible. Thus, the 2008 financial crisis was not strictly financial. It began with disastrous political decisions that allowed average investors to be exposed to toxic financial products. The 2008 financial crisis effects caught most people off guard and spread fast worldwide. The banking system was fully interconnected globally. Thus, many European banks have lost hundreds of billions of euros when the Lehman Brothers collapse occurred. The European Central Bank and various governments had to adopt measures to rescue banks and consumers. The risk was a serious liquidity crisis in Europe and massive social unrest. In my view, the 2008 financial crisis summary in a single sentence might go something like this. The collusion of the financial and political worlds prevented those responsible from making the best decisions in the interest of consumers, investors, and citizens. Politics built the powder-keg, the banks then brought the matches to set it all alight. As happens so often, lessons are learned and policies practiced for a few years. Then hubris arrives again. Once again, politics has brought hubris. President Trump has stepped into the White House and promised a major tax cut program that has set Wall Street on fire. The S&P has hit new records, and real estate prices and mortgage interests are rising again.